The new modern homes Portland residents see are thanks to the skills and creativity of area architects. At H. Hudson Homes, we work with award-winning architects who embrace our passion for modern homes with cutting-edge designs that blend livability, functionality and sustainability. Founded by John T. Holmes and Jeffrey Stuhr, Holst Architecture specializes in residential, commercial and mixed-use housing. Its innovative buildings express the highest social, environmental and aesthetic ideals with understated sophistication. The Holst team includes LEED-certified architects who have won awards for their commitment to energy efficiency. Sean Cho is a Portland- and Bend-based architect whose creations have a Danish-inspired, distinctly modern feel. The progressive architect has worked with H. Hudson Homes on projects like the Bend 10 and home remodels. Every element that Cho adds to his works is deliberate and thoughtful—from the dark, wood-stained cabinets to the views outside the windows. H. Hudson Homes built modern rowhouses in northeast Portland designed by Reworks Architecture. Rework is a local, innovative design-build firm whose mission is to create livable communities and quality crafted homes from design that is deeply rooted in sustainable building practices. 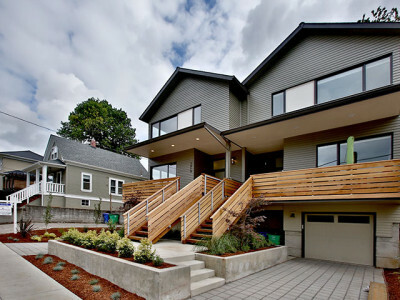 To learn more about new Portland modern homes, Oregon residents should not hesitate to contact H. Hudson Homes. George Hale is the owner of H. Hudson Homes. H. Hudson Homes specializes in building new modern homes in the Portland, Oregon and surrounding areas with an emphasis on cutting-edge design and sustainability.